Now designated as Davao Region, Region XI, is one of the regions of the Philippines located on the southeastern portion of Mindanao. 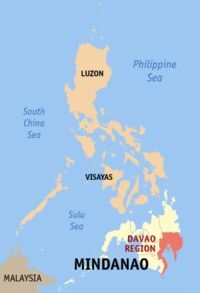 Davao Region consists of four provinces, namely: the Provinces of Compostela Valley, Davao del Norte, Davao del Sur, and Davao Oriental. The region encloses the Davao Gulf and its regional center is Davao City. Region XI was originally referred to as Southern Mindanao, and in addition to the three Davao provinces also included Surigao del Sur and South Cotabato. At that time, Compostela Valley was still part of Davao del Norte. Republic Act No. 7225, ratified on March 16, 1992, created the province of Sarangani from South Cotabato. Then, Republic Act No. 7901, signed on February 3, 1995, by President Fidel V. Ramos transferred Surigao del Sur into the newly created region of Caraga (Region XIII). Finally, on September 19, 2001, President Gloria Macapagal-Arroyo's Executive Order No. 36 reorganized the regions and provinces in Mindanao. This moved South Cotabato and Sarangani to SOCCSKSARGEN region and renamed Southern Mindanao as Davao Region.